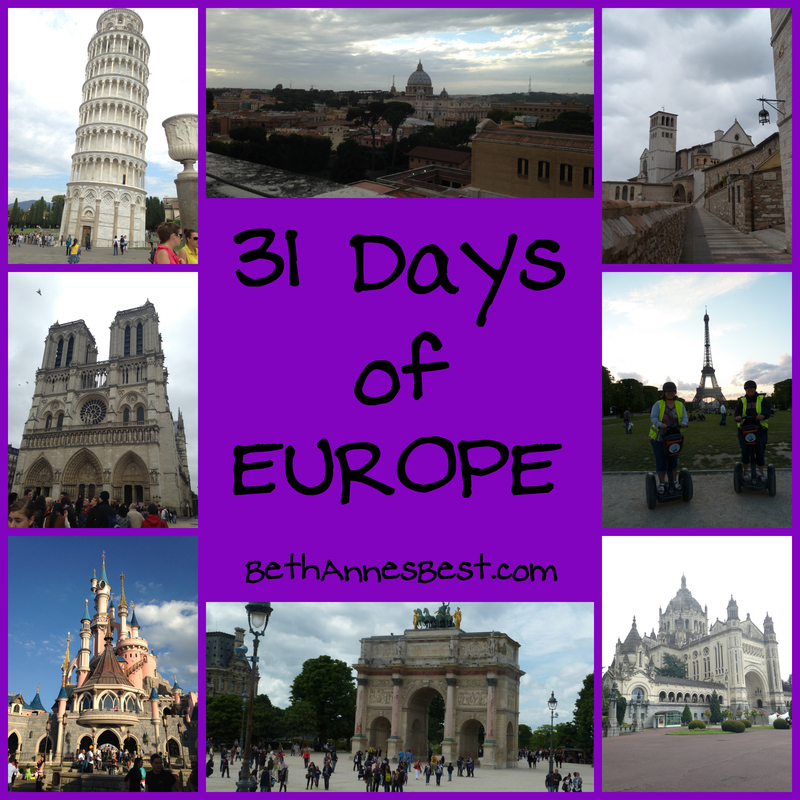 This is Day 5 of my 2014 trip to Europe. If you want to read the other posts about my trip go here. Today was our first full day in Santorini, Greece. 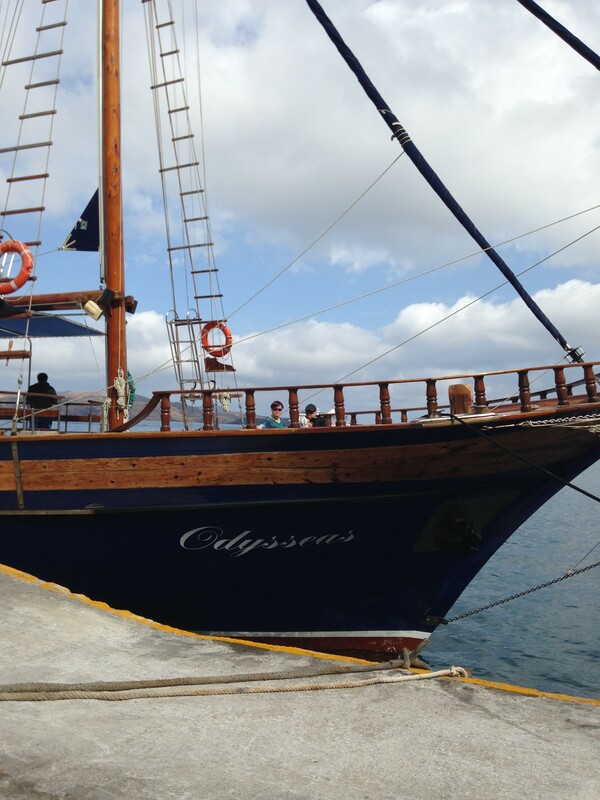 Today we went on a sunset cruise that stopped at a volcano, seismic waters, and the island of Thirasia for lunch. I wasn’t sure what to expect on the cruise but walking on the volcano was really cool. I didn’t go all the way up the volcano (we only had 45 minutes at the volcano) but I saw some really cool things on the bottom parts of the volcano. 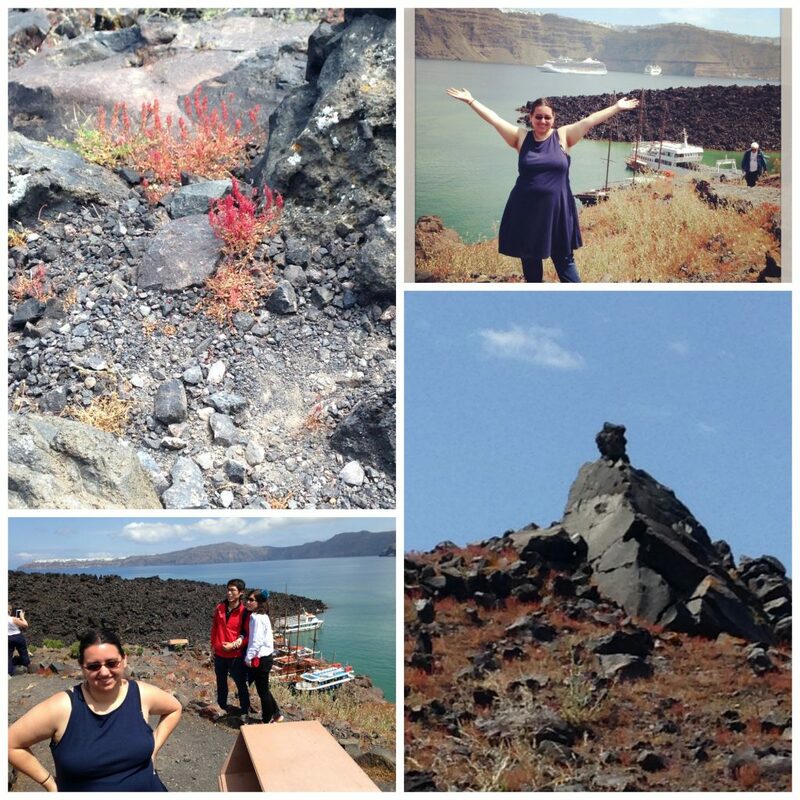 I saw a rock that looked like an owl, flowers growing in the volcano, and beautiful views all around. The one thing I was amazed about was how there were FLOWERS growing in the ground. I can’t even get flowers to grow in nice clean fertilized dirt at home, yet in the middle of all these rocks and gravel there were legit flowers growing out of the ground. Mother nature is weird like that I guess. I took some pictures on the volcano and the one in the bottom left makes me laugh every time I look at it because the couple behind me photobombed my picture. 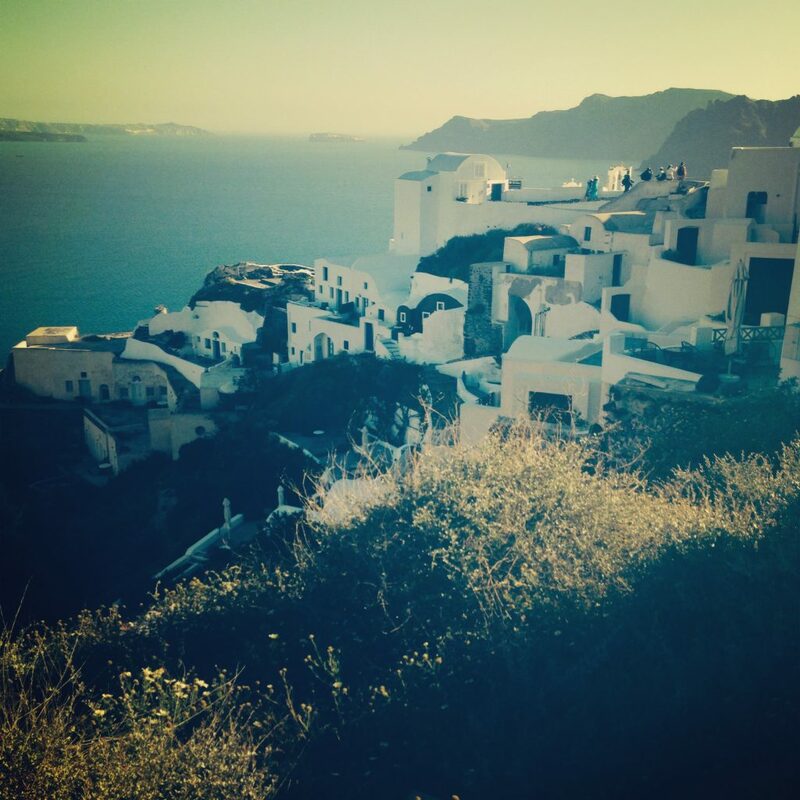 It was fun throughout Greece to take photos on top of landmarks as it felt like you were on top of the world. I really enjoyed learning about the volcano and how due to the eruption of the volcano the island of Santorini was formed. It reminded me similarly to Hawaii’s forming. I took a Geology class several years ago and can remember learning about Volcanic Eruptions, erosion, and what the different colors on the side of landmasses meant. It was amazing to see the geology in the rock throughout the island. I had even posted some photos on Facebook and my mom and other people even said they could clearly see the Red and other colors in the rock just like they had learned in school. I really love seeing things in real life that I once learned about in school or read in a book. 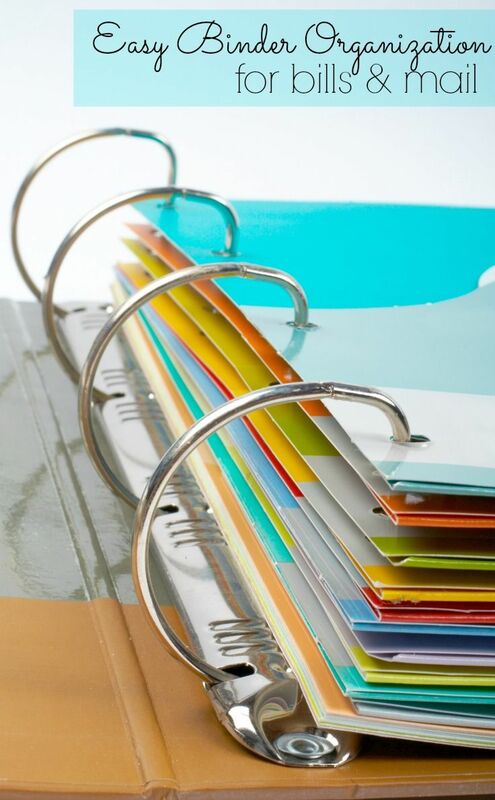 It connects all the dots of the learning together. After we climbed the volcano I got to swim in Seismic Waters! This was a really awesome experience. The water was COLD but it was a once in a lifetime opportunity so I took it. As you swam closer to the volcano the water got warmer and bubbly. It was a really weird feeling. You could see that the water was on the red side and my bathing suite has a pinkish tint in it now. We ate lunch in an area called Thirasia. I had Roasted Eggplant with Feta cheese on it and it was delicious. After lunch the boat headed around the other side of the island so by the end of the boat ride we had seen the entire island. This is where the “sunset cruise” became confusing. The travel agent they told us it was a sunsets cruise because they drop you off right before sunset or you can stay on and watch the sunset….but they dropped us off back in Oia at about 3:30pm. They told us when we got off the boat we would have to walk up 200 steps. However, when we got off the boat it looked more like 2000 steps. 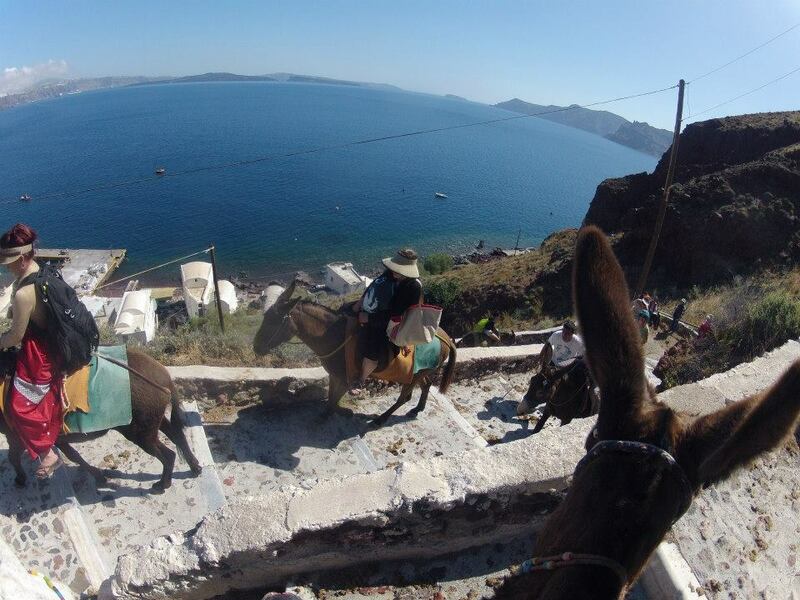 Conveniently they had Donkeys waiting for us that we could ride up the stairs. 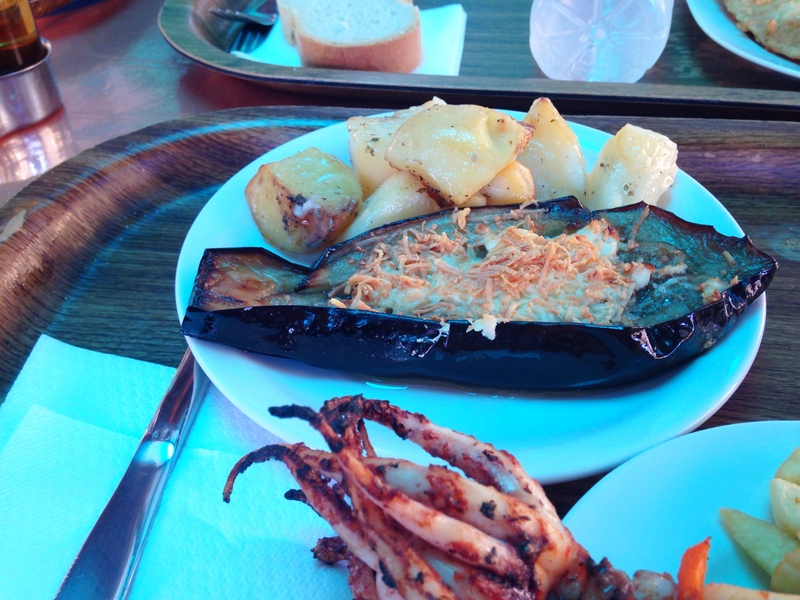 It was the best 5 Euros I spent the entire trip! And I’m pretty sure the 200 steps was what you had to walk AFTER the Donkey ride. The donkey ride was a little scary at times but it was definitely a memorable experience and glad I was able to do it just like they do in the movies. Once we got to the top of the steps we were in an area called Oia. This is the same area that the Sisterhood of the Traveling Pants movie took place. It was really neat to try and picture the movie and see the area in person. 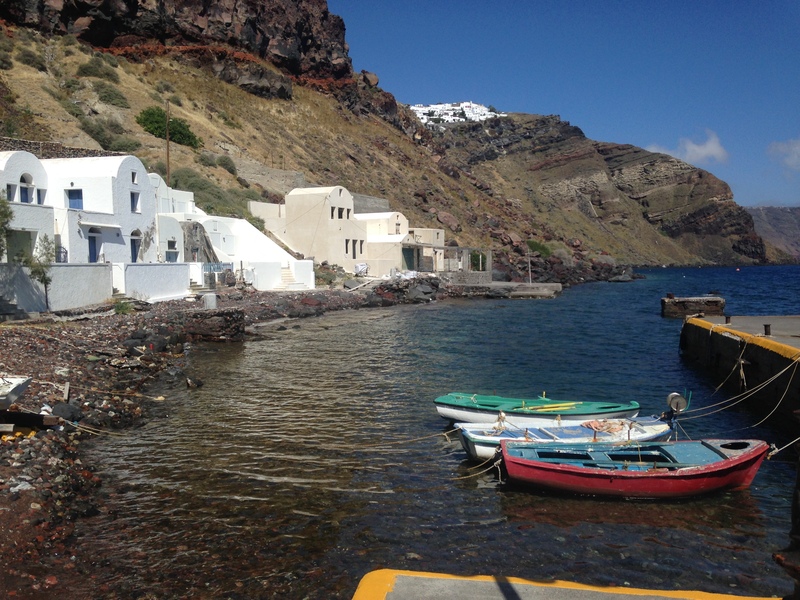 The area was much more crowded than the area we were in yesterday (Fira). 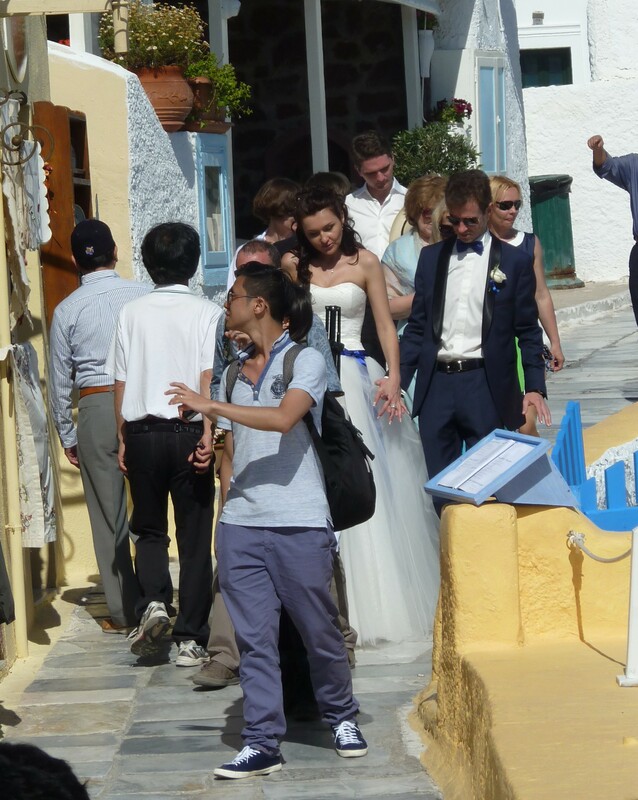 The one thing I noticed was I saw about 5 weddings, lots of cats, and a dog fight. Yes you heard me right a dog fight. Okay it was really just about 3 different dogs barking at each other from 3 different locations but it was still a sight to see. One of the store owners had to chase the dogs away so that people could pass by again. 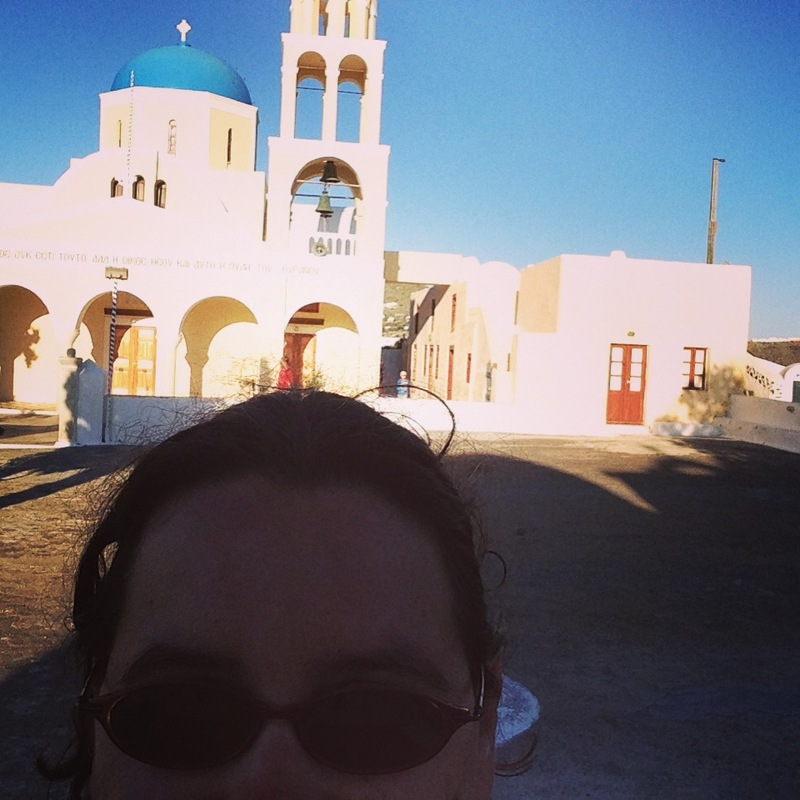 Like I mentioned in my last post there are over 300 churches on Santorini. Here is one right after a wedding. For some reason I had a lot of pictures of this one cat sitting and standing in different ways. So I made a collage of him/her. Before we headed back to the hotel we watched the sunset out in this grassy area. It was a much different view but it was beautiful nonetheless. 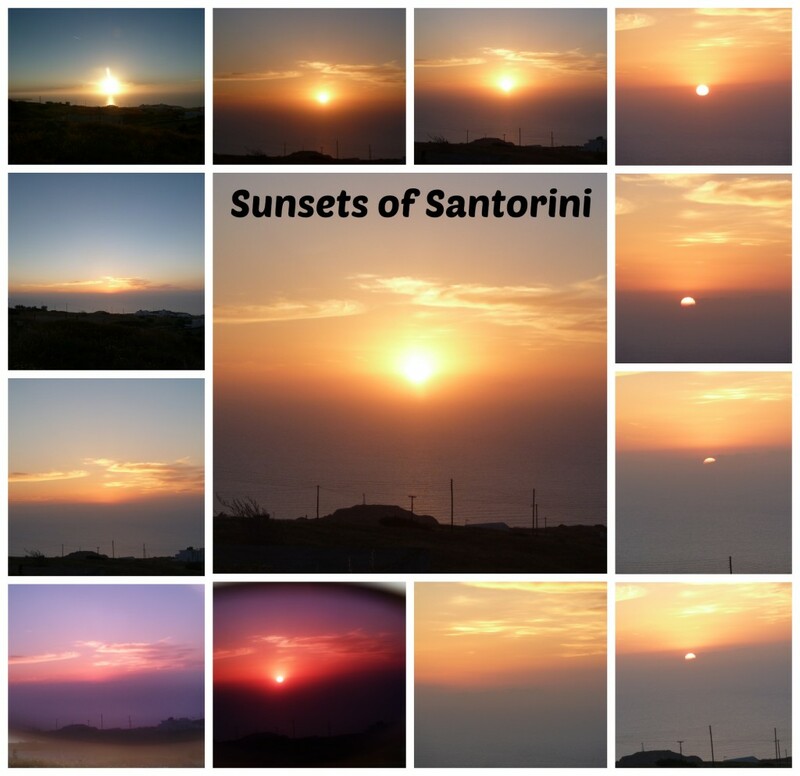 I couldn’t believe how beautiful the sunsets were in Santorini. It was nothing like any other sunset I have seen before. One of the sunsets I posted on Instagram and someone said they wanted that color on their wall. I agreed it would make an awesome color on the wall. The sunsets reminded me of a book I read in elementary school called the Legend of the Indian Paintbrush. The little boy in the book wanted to paint the reds and oranges of the sunset but didn’t have the right colors available to him for it to come out right and as hard as he tried he could never get it to look right. Then one day he found the colors and was able to paint the colors of the sky. I’ve never been much of a painter but I think I was able to capture the sunsets pretty well with my camera.